Montana Tech, the Montana Bureau of Mines & Geology (MBMG), and Butte-Silver Bow (BSB) have teamed up to develop the only Unmanned Aerial Vehicle (UAV) training and research area in the state of Montana. 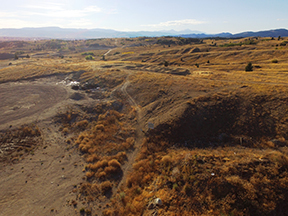 In 2018, a memorandum of understanding (MOU) was developed between BSB, the MBMG, and Montana Tech to create a UAV training and research area that encompasses the Montana Tech campus and BSB’s Big Butte open space park (fig. 1). The objective of developing this research area was to provide BSB and MBMG staff, and Montana Tech researchers and students, with a safe, undeveloped location to conduct supervised training and research using UAVs. For more information, please contact Jeremy Crowley at 406-496-4772. Figure 1. The red outline is the UAV training and research area which covers approximately 500 acres. The research area includes the Montana Tech Campus, the World Museum of Mining and the Butte Silver Bow Big Butte Open Space Park.